Leave your old cartridges in the product until you are ready to replace them to prevent the print head nozzles from drying out. Do not open ink cartridge packages until you are ready to install the ink. Cartridges are vacuum packed to maintain reliability. 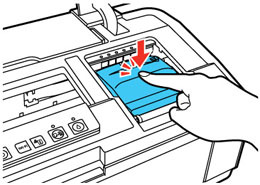 Make sure the CD/DVD tray is not inserted in the product, and the power light is on but not flashing. 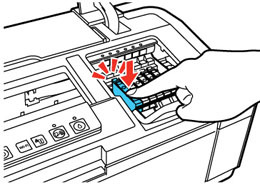 Press the ink button to move the print head to the ink replacement position. If a cartridge is expended, a solid light appears above it. Note: If an ink cartridge is low, a flashing light appears above it. You can continue to use the low ink cartridge until it is expended. 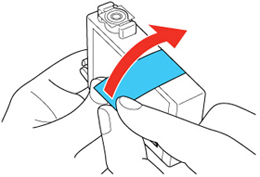 Do not hold the ink button for more than three seconds, or the product may start cleaning the print head. Do not move the print head by hand; otherwise, you may damage your product. 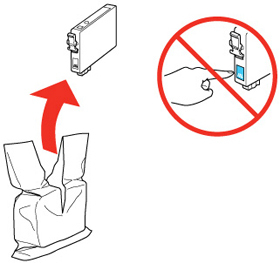 Do not touch the flat white cable inside the product. 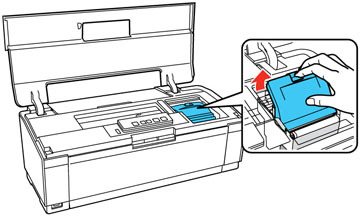 Once you replace all the cartridges that need replacing, close the cartridge cover and the printer cover. Press the ink button to begin charging the ink. This takes about 2 minutes. When the power light stops flashing and remains on, ink charging is finished. Note: If the ink light is on after the print head moves to its home position, the ink cartridge may not be installed properly. 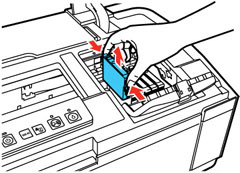 Press the ink button again, and press down the ink cartridge until it clicks into place.